Twiggle Box: I Love Chocolate! Valentine Heart Cookies! These Yummy Cookies are easy and fun for the kids to help make! Leave plain chocolate, or fill with frosting for a variety. One of our favorites, we call them "Home-Made Oreo's!" We usually make them round, but wanted to try a heart shape for Valentines day. Here's the Recipe, so you can try them for yourself! Mix Vegetable Oil, Chocolate and Sugar until well blended. Add Eggs one at a time and Mix well, Add Vanilla. Mix flour, Baking Powder and Salt, then add to Chocolate Mixture and mix well. Chill dough in Fridge for several hours or overnight (I stick it in the freezer to speed up the cooling time!). 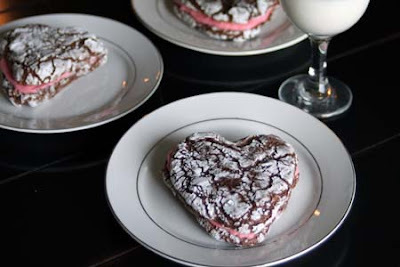 Drop by Tablespoons full into the powdered sugar, coat well and then shape into hearts (or, for normal circle cookies, balls). 3 oz Cream Cheese, Softened. Mix until a smooth and creamy consistency, adding more or less Powdered sugar depending on desired thickness. Spread onto one cooled cookie, and top with another cookie. Cookies filled with Cream Cheese frosting should be kept in the refrigerator. Hopefully you enjoy these cookies as much as we do! Happy Valentines Day!